That's what they call them now, wellness visits. And we happened to have Ben's 4 year physical and Hailey's 18month physical this afternoon. Ben is as healthy as ever. He was such a good patient. Sat so calmly, followed directions, amazing. He is 43inches tall and 41lbs (Brian recalled those numbers), and Hailey is 35 inches long and 26lbs. For Ben, I have no idea where this puts him chart wise, they didn't say, all they said was "HE IS TALL!" We'll look it up. Hailey is way off the chart for length, like at least an inch above the curve for length, and 75% for weight. And yes, Brian was with me to help me with taking both kids because we just returned from Kalamazoo for my Grandpa's funeral which was yesterday (Sunday December 16). It was nice to be with everyone and celebrate, but well...you know. Nice that Brian got the day off so we could stay over. Work our way home, get kids to doctors, errands, all that stuff. Aunt Lenore, Hailey, and Grandma, she's really getting used to other people! Finally! 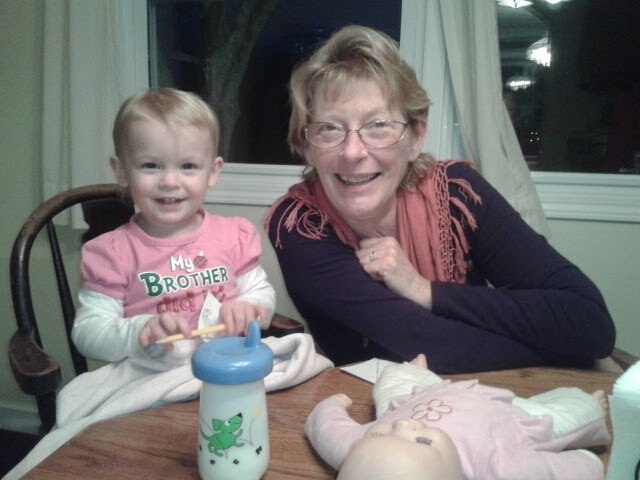 Hailey and Aunt Maggie had a special connection! I clearly don't know how to do the You-Tube thing, so maybe Brian can help me when he gets home. But I'm here with my kids, we've had a wonderful day of celebration! Ben is so excited for his birthday! We went out to lunch, bought a balloon, he helped me make his cake, and now waiting for Daddy so we can open presents and eat said cake! We were sad to turn on the tv and see what happened this morning as we were celebrating. My heart is broken for those families who got up this morning, sent their kids to school as they always do, and then this. So tragic. We will give extra hugs and kisses to everyone today and remember that you need to tell each other how much we love them! Ben: FOUR YEARS OLD TODAY! He's thriving! He screamed "Birthday boy here!" all the way through the grocery store this morning! Never shy! His biggest achievement as he hits 4 is that he is completely out of any sort of pull up! Even at night!!!!! It's so nice for all of us! Hailey: 18months old! She had her developmental exam yesterday and has her physical on Monday (as does Ben). She exceeded everything except verbal skills. Yuck. She has a big brother that does all the talking for her! She was able to point to all appropriate pictures and body parts but she just can't quite say them all. She has her words for things which are generally the beginning of the actual word (example: "Mill"=Milk, "No"=nose, "plee"= please, and a ton more). The Dr. said she's not worried yet because she is trying and mimicking so well. As for any of her motor skills, she is off the chart! She's doing a lot of things at a 2 year old level. Likely keeping up with Ben has assisted in this! Now, I know there a number of parenting no-no's in this video, but I think I can explain at least a couple. Hailey doesn't have a shirt on because she just messed it up at dinner, we stripped it off and she ran over to do this. She's standing on a chair, I know, but they were having so much fun! Ben's playing a video game, I know. He's actually getting very good at them and we are limiting his use of media! We've had more successful trips to see Santa. Santa understood. He and Ben had a nice talk after I "rescued" Hailey. This didn't really surprise me. She's a little...sensitive to strangers. It comes with the age. News: I started a new job last week and have my first day following orientation tomorrow. I'm excited. I'll be back in the hospital! Working for Advocate Christ Hospital. It's closer to home and I'll still just be "substitute teaching" for therapists which means I keep my flexibility. Should be great! Also news this week. 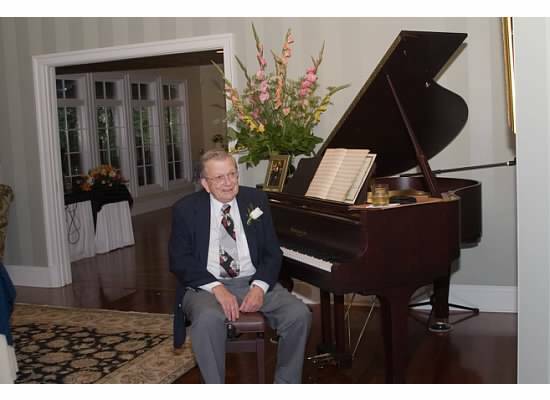 After 85 years, 1 loving wife, 4 children, 7 grandchildren, and 7 great grandchildren, my Grandpa passed away after a mercifully short illness. Although it didn't seem short in the midst of it. It's well known, and documented how much he meant to me and my family. It's still so strange that he is gone and we're all still coming to terms with that. He is reunited with my loving Grandmother, his daughter and son who all went before him to warm things up for him. My favorite photo of all time! 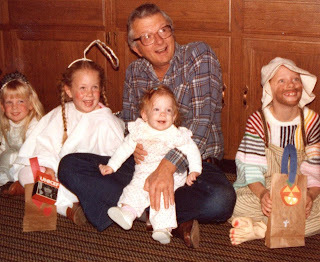 The Huling girls with Grandpa, Halloween 1982. 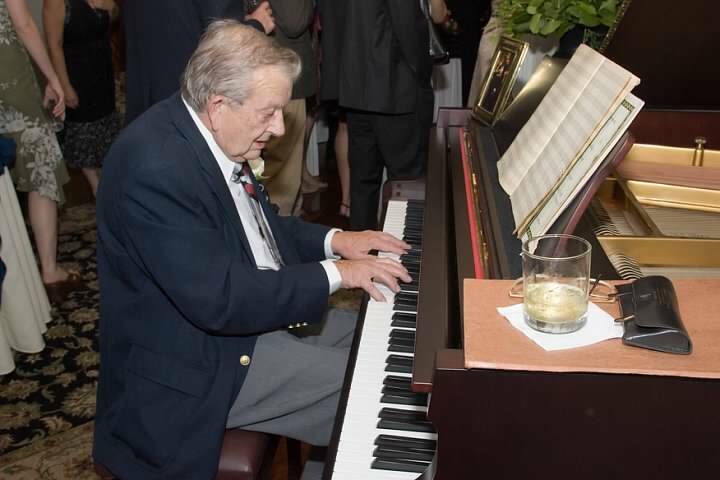 One of my favorite memories is of him playing the first dance for me and Brian at our wedding in 2006. It was a piece he wrote for my Grandmother as a wedding gift to her called "The Love Waltz." No one has a better first dance story than that! Thanks Grandpa! I will try to get back on track! It really is amazing how time is going by. We're happily busy here. I remember when Ben was Hailey's age and I blogged every week. Now we're plus one and somehow I NEVER have time. So, here's what we've been up to. Beach, more beach, in various states. Settling in with a warm fall. Today is a very cold rain on this election day 2012. The kids are amazing. Let's start at the top. Abby: Very healthy. She is handling her Limes Disease without any ill effects that we can see. Her hips are in great shape. She spends her days going from soft surface to soft surface. Luckily for her, Hailey has figured out child locks on cupboards and therefore can get her treats on demand. We're keeping her weight down even with this...somehow. Ben: Seriously LOVING school! He makes sure he gets his homework done as soon as we get home. He has school twice a week and wishes it were more. He's been VERY healthy (knock on wood). He continues to be the best big brother I've seen. He has even taken to wanting to make lunch for him and Hailey. Let me tell you, his ham sandwiches are second to none. He gets out all necessary ingredients, assembles, cuts (with butter knife) and serves. Really, they are perfect! Picking him up from school is also a treat. The two of them love each other so much. As soon as Hailey and I round the corner they have to hug! The preschoolers are supposed to stay in their spots on the rug, which Ben does, but Hailey has to run up to him and sit with him or she screams. It's so sweet. They also have a night time routine that I somewhat caught on video. Hailey knows when she needs to go to bed. Generally around 7:30pm. She starts saying "nigh nigh!" We tell her to go give everyone a kiss, which she does. She has to kiss Ben, Hailey, Mom, and Dad, then grabs her blanket, baby and just goes to bed. If she somehow misses kissing Ben, or he's downstairs, he'll yell "HEY! I didn't get a kiss!" And sh has to run back and kiss him. They'll hate me for saying this someday, I know. Ben is still the tallest kid in preschool. It's so amazing to see him as a little boy and no longer a toddler. Hailey: She's getting better. We've actually been dealing with a bladder infection for the last week. She's had on and off fevers for weeks. We've taken her in, ears and throat clear, so they send her home. If the fever doesn't improve bring her back. Well, it'll go away for a few days, then come back. We started just blaming it on teething. And boy was she fussy! Until last Tuesday when she woke up from her nap with a 105 fever. I sat in her doctors office Wednesday and insisted they keep looking, that something else was going on. And there we go. Yup, I was that Mom, but it paid off and we know what's going on. Antibiotics in place. Vocabulary: Exploding! She's just getting it! The doctor seemed worried at her 15month physical but I do believe that may have just been due to her brother doing all the talking for her! And if you've seen Ben lately, you know that boy can talk! We've got Momma, Dadda, Ben, Abby, wawa, puppy, baby, blankie, milk, please, just to name a few. Eating: She may be worse than Ben at this age. Maybe it's just the age. But she really doesn't want anything to do with food at this point. She's just as big a milk addict as Ben was, maybe more. She still prefers any fruit and even some veggies over any sort of protein. I can't even tell you what her favorite food is right now. Maybe pears? Can milk be considered a food? Sleeping: Everyone's doing ok with this. Ben is Ben. He's in bed by 8 or 8:30. He sleeps till 7-ish. Naps are becoming more hit or miss. But we at least have quiet time every day. Hailey is trying to get rid of her morning nap already. But then her pm nap is getting longer. She sleeps from about 7:30pm till 7am. With this infection we've been getting up around 4 am, but that's getting better. I really don't mind her giving up the morning nap as long as she doesn't get too grumpy. It gives us a chance to get out of the house! Halloween was amazing other than that was Hailey's sickest day. Ben was Superman, and Hailey was a little Devil. I thought the devil was ironic until the days leading up to Halloween! She's so sweet until she's sick! Ben got to walk around the neighborhood with the neighbor kids and was definitely the most outgoing. Videos to come. He was running to the rescue of fellow trick or treaters! Hailey and I stayed home mostly. She loved watching the kids coming to the door. She was so out of it. I tried to take Ben out after Brian got back with him but he was so tired. He was dragging his bag around on the ground to the point where it got a hole in it somewhere and we were leaving a trail of candy behind us. It was so sad. He didn't even care. I gave him a piggy back ride home from there. If you thought Hailey had a crazy summer, look at Ben. No, seriously, look at Ben. His face stuck like that. Nope, nevermind. Faces always rebound when you're smiling. Okay, okay, okay - Bath night is not usually blog worthy. But tonight? When a triple crown is in the making, a debate is there for the taking, and my head is shaking...at how cute my kids are! Please note - no children were harmed in the making of this video. Despite the screams. This was truly the summer of Hailey. She turned one. She hit the ground running, and has not stopped. Just look at a smattering of the craziness which 2012 held for our baby girl. And I'm spent (says Hailey). Ben's First Day of School! Quick post with more to come, hopefully. I want to start putting the kids development type stuff up again (for my own memory, too!). Anyway, we're settling into a schedule and glad for it. 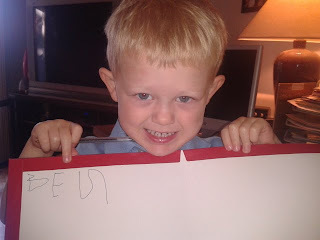 But the BIG BIG news is that Ben had his first day of preschool yesterday! He's about 2inches taller than all his other classmates, to the point where at orientation last week I had to double check with his teachers (Miss Denise and Miss Cathy) that he was in the right classroom, which he is. He's just VERY tall! He's been very excited! 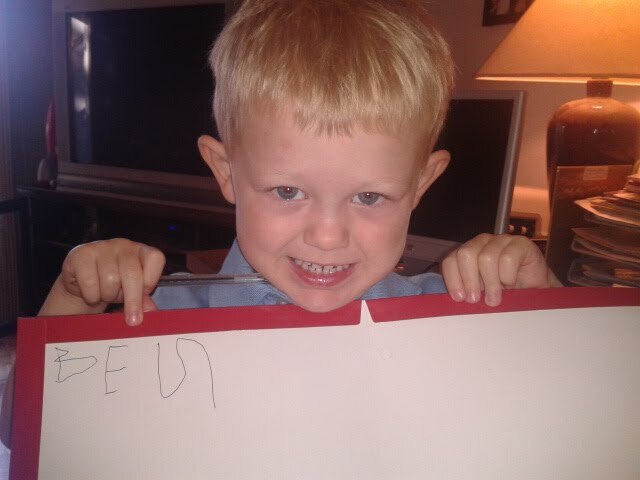 He wrote his name in his folder for school. And did GREAT on his first day. 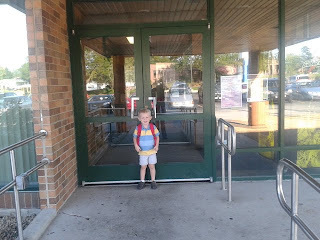 He ran into that classroom without looking back (parents weren't allowed in on the first official day). He was given one homework assignment and on the way to lunch after school he said "Mom, I should do my homework first." Seriously!!!!?!?! I hope this enthusiasm continues. I just wanted to take him to lunch on his first day! He has show and tell tomorrow and has been practicing a magic act with his teddy bear (TOTALLY his doing/idea). I'm serious. A magic act. Hailey is doing very well. We came home after dropping Ben off and she immediately fell asleep so I had MORNING QUIET TIME! I got so much done. I had to wake her to go pick Ben up. When we were allowed into his room for the synopsis of his first day, she screamed with excitement when she saw him and just kept pointing at him going "Ba...Ba...Ba..." The class needed to stay seated while the parents filed in and Ben was one of about 1/2 that actually stayed seated! The others ran for their parents. So proud! He did yell "Mommy!!" But did not budge! I think this is going to be great! More to come, Ben is begging me for walk and it's actually not too hot out to do that! We are back home, but wow. We are back home from our whirlwind tour of the eastern states. Illinois, Indiana, Ohio, West Virginia, North Carolina, Virginia, and back. 1947.2 miles. We'll put all the pictures and videos up eventually, but here is just a taste of the fun! I'm thinking we might need a Month of the Blog here soon. We've got alot to catch up on! Here's a video of our two (and only) kids to tide you over! So, Major League Bishopers, this is not a test. This is not a test of the emergency broadcast system. Please go to your nearest list and find out what you need to do in the 20 minutes that both Ben and Hailey are asleep. 1) Clean Bar. The bar usually doesn't need cleaning. I mean, we clean it out every weekend, if you know what I mean. Actually, I don't know what I mean anymore. The bar is so seldom used that it is full of dust and cobwebs......and I just got why it is on my list. 2) Clean Desk. The desk always needs cleaning. We have one laptop with external monitor, 3 cell phones, one camera, one camcorder, 2 iPods, 1 printer, 1 speaker set with subwoofer, 1 garmin GPS wristwatch, 1 mouse, and a variety of power cords, adapters, and various sundry. And we just got a new laptop (ASUS!). With five more cords. Ugh. 4) Add Hailey to our Flights. She's a child in lap, so she doesn't need to actually have her own ticket. Thank god, because flights are big buckaroos. It takes about 20 minutes to talk to the non-English speaking telephone operator to convince them that Hailey is young enough (under 2) and I really don't need to pay a fee for her. I mean, if it comes down to fees, we can always stuff her in a carry on instead. About the same price nowadays. 6) Write a New Blog Post. Check. PS - HAPPY FORTH OF JULY! PPS - Patricia is a goddess for doing this every day she doesn't go into work. She gets more done in those 20 minutes than I can even imagine. Hey Major League Bishopers! We've been on a Hailey string of posts here, but why stop? She's growing like a weed, she's 1 year old, and now she's super walking. The glamour girl knows how to move! 10 days can make such a difference. Yes, it has been the week (or two) of Hailey! She is one, there have been many rites of passages that have happened. She has dug into 2 chocolate cakes, she has tried walking, she has now gotten 2 "one year" molars! She is amazing! No, things have been going very well. She had an amazing party at Mom and Dad's with all her cousins there! She had a ball! DUG into the cake. We also had a little party on her actual birthday here at the house. I took the day and made sure I didn't work and we were just together. 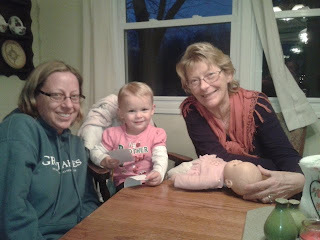 We then spent time at the cottage with aunts and cousins and had an AMAZING TIME!!! We were exhausted. Daddy couldn't make it unfortunately, but we managed. Ben LOVED the water. Did a great job staying close to shore with his life jacket on. He had a great time in the creek playing with all his cousins. Then back to home, work work work, Father's Day weekend! It was all about family and food! And today Hailey had her 1 year physical! She is perfectly healthy, no worries what so ever! She is 21lbs and I have to ask about length again (I was busy with 2 kids in a dr's office for 1.5hrs!!!). But I do remember her showing me the chart and saying she is 50% for both length and weight! Average! I now call her my little peanut! We were used to "gigantour Ben!" Ben didn't see an official growth chart for 2 years, and now Hailey is 50%. We just weren't prepared for that.... Brian's all worried we aren't feeding her enough already. She'll be fine! Let's not worry yet! She's actually right where she needs to be! Not some giant the Bishops created! Anyway, some videos for your enjoyment. Hailey is trying to walk more and more! Ben continues to be a very caring and nurturing older brother! He just wants to help me make her happy and play with her all he can! My work schedule slows substantially for the next few weeks so hope to update more and more! But also hope to play with those little people in my house more and more, too!!! Patti, Brian, Ben, Hailey, and Abby! Hey hey hey! We gotcha photos here! Video to come! Hailey and Mom, June 5, 2011. 1hour old. And yes, it's all Hailey all day! Both kids are sleeping. Time to go bake a cake! I just want to say really quickly, how much I love my sweet Hailey! How much I am flooded with memories of our day one year ago. Thank God for neighbors who were home (Bonnie Becker!!!! ), and for my husband's ability to run red lights in the safest way you could possibly run red lights in order to get me to the hospital a mere 9 minutes before Hailey made her entrance! We've been going nonstop ever since! More pictures and video to come of a fun filled celebration!